A statement by the United Nations stated that the ‘Decline of honey bees is now a global phenomenon’, today the EU has voted for a permanent ban on pesticides that are harmful to bees. Earlier this year a report released by the European Food Safety Authority (EFSA) found that most uses of neonicotinoid pesticides represent a risk to wild bees and honeybees. Under the new regulations, the use of imidacloprid, clothianidin and thiamethoxam outdoors will now be banned in EU member states. Insects make up about two-thirds of all life on Earth, but the last 25 years has witnessed the most dramatic decline in the numbers of flying insects having dropped by 75 per cent. Insects play an essential role for life on earth as pollinators of plants and prey for larger animals, their loss would and is already having a profound impact on our World. This wonderful news today from the EU gives us hope that we can halt the decline in our Bee populations, and with our help we can over time hopefully reverse this unrepresented loss of our insect life, especially our hard working Bees. 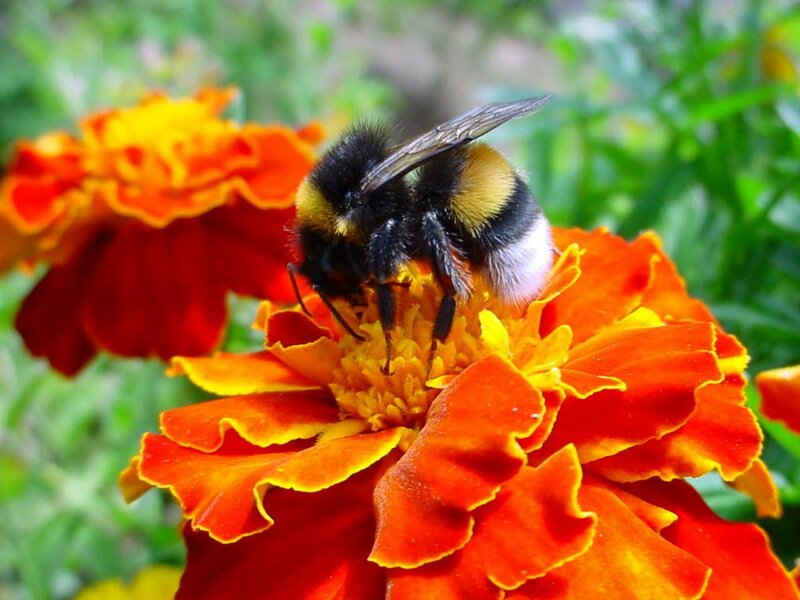 One of the ways we can help save the bees is to plant flowers, by planting flowers especially ones indigenous to your area we provide food to feed the bees and other valuable pollinators. By planting a pollinator-friendly garden you are not just saving our Bees, we are ultimately saving ourselves and the Planet. Having a good night’s sleep can make a big difference in your quality of life. Just ask any ‘New’ Parents how sleep deprivation has impacted on their lives. In the busy world we live in, it is not only parents of young children that are not getting enough snooze time but we could all do with a better night’s sleep. How do we relieve stress and get a better night’s sleep and why is it so important? Studies have proven that sleep deprivation can adversely affect the brain and your cognitive function, a study by the Harvard Medical School and the University of California at Berkeley revealed, that sleep deprivation causes the brain to become incapable of putting an emotional event into the proper perspective and incapable of making a controlled, suitable response to the event. Put in a ‘Nut Shell’, even the simplest tasks become harder or impossible to preform. It not only effects our physical but also our mental health. There are so many things that we can do to help improve our sleep patterns, from insuring that we have a comfortable mattress and pillows, that has not exceeded their life expectancy. To making sure that we regulate our body’s clock, by scheduling a routine of the same bedtime and wake up time, even on the weekends. Try to avoid eating a heavy meal or having that last sneaky peak at a mobile device before bedtime, your body needs time to shift into sleep mode, so spend the last hour before bed doing a calming activity. An excellent way to help relieve stress and unwind so that we can all have a better nights sleep is to ‘Use our sense of Smell’, our olfactory nerve is connect directly to the brain and sends signals directly to many different parts of the brain, including the limbic system and amygdala, which are in charge of emotions, mood, and memory. So why not use a scent or perfume to help relieve stress, relax the body, and promote better sleep. A number of essentials oils have been shown in studies to lower blood pressure, heart rate, and skin temperature as well as changing brain waves to a more relaxed state. From Lavender to Bergamot, Ylang Ylang to Clary Sage , these are just some of the wonderful essential oils that have been used in Aromatherapy to tap into the healing power of scents in order to help calm, de-stress and relax both your mind and body. So why not try and find one that is suitable to you. When Sunshine puts a Spring in our Step. With the Weekend underway and when Sunshine puts a Spring in our step and a Smile on our face. We took a look at some of the wonderful things that we could do this weekend. If you have not made a plan for the weekend but would like to go out and enjoy the first Sun filled days of the year, simply check the web for events that are happening in your local area this weekend. You will be amazed at how many inexpensive and enjoyable ‘things to do’ pop-up. From Craft and Farmers markets to Lambing season at specialist farms, to a walk in your local parks or woods to see that ‘Spring has finally Sprung’. So what ever you plan to do, even if you end up working in the garden (like most of us will have to), or if you simply plan to put your feet-up and watch the Masters at Augusta, we wish you a Sun-filled, happy and relaxing weekend. Why Do We Love Scented Candles? Luxury Lavender Candles are one of life’s simple pleasures. If you have had a hard day, want to add a touch of ambiance to your home, or just want to put your feet up and relax, a scented candle can come to the rescue. The world can seem like a much brighter place, once the glow of the flame starts to dance, and your favourite scent fills the room. There really is no better way to end the day, than by letting any tension of the day slip away, enjoying an evening bathed in soft candlelight, and surrounded by a beautiful fragrance. Some fragrances in scented candles that are easily recognisable. Candied sweet vanilla is a staple of the scented candle, wonderful for any time of year. Cinnamon is perfect for the holiday season, adding some delicious festive spice. Then there is lavender, one of the most recognisable fragrances in the world, it’s distinctive scent is fresh and light, floral but not overwhelmingly so. 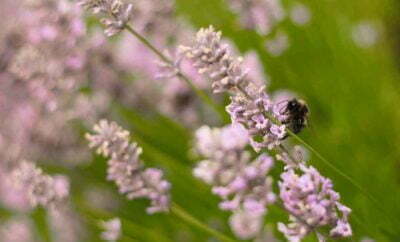 It goes without saying that a good quality natural lavender candle, is a wonderful addition to any Home. Why are PAIRFUM London Diffusers the ultimate perfume reed diffusers? We are frequently being asked why the PAIRFUM® Reed Diffusers are the ultimate Natural Luxury Reed Diffusers. So let’s start at the beginning, as we believe it is a very good place to start! ( apologies we could not help but quote ‘The Sound of Music’ as Reed Diffusers are “One of My Favourite Things” – that’s the last one promise). How do PAIRFUM® fragrance reed diffusers work? They will naturally disperse fragrance throughout a room via the natural rattan reeds. Once placed into the aromatic liquid, the porous fibre reeds will draw the liquid up and the fragrance is diffused from the reeds into the air. PAIRFUM Reed Diffuser are designed to be displayed, Simply open the bottle and insert all the reeds into the perfume infusion. 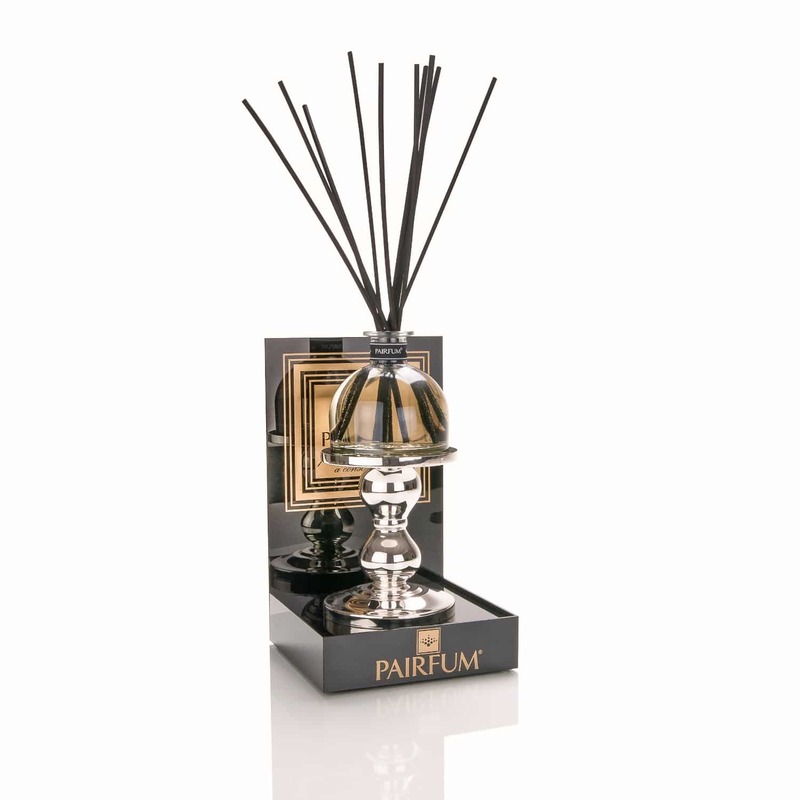 The long black elegant reeds will, draw the liquid up and allow it to diffuse into the room to envelop your home with, exquisite, natural couture perfume. If you would like to read or find out more about the PAIRFUM London Reed Diffuser, please click on the link below. Why are they the ultimate perfume reed diffusers? The PAIRFUM® Diffusers allow you to regulate the perfume intensity & longevity to your personal taste through,the number of reeds you insert and by how frequently you turn them. The more, reeds you use and the more often you turn them over, the stronger the perfume in, the room will be. Air flow and local conditions will also affect the longevity of the, fragrance infusion. PAIRFUM’s Natural Luxury Reed Diffusers are ‘Sensory Accents For Every Room’ and will infuse your Home or Office with evocative couture perfumes. How long will my perfume reed diffuser last? These Essential Oil diffusers are fantastic for the home or the office because they emit, aroma subtly, so that the scent is never too overpowering. The high quality PAIRFUM® diffuser will last for several months, depending on the size of bottle you choose from our Large Bell 250ml Diffuser, to our perfect entry point 50ml Diffuser. We have a wide selection of Natural Perfumes and Diffuser sizes to choose from, and the table below shows you how long each respective bottle size will last. Once the content of one bottle has been diffused the natural fibre reeds will be fully, saturated and need to be replaced., this will ensure that your new Diffuser will work as perfectly as the one you have just enjoyed. Just like flowers, natural essences and perfumes vary in fragrance strength. Our noses, more readily detect heady spice fragrances than delicate floral ones. Depending on, the effect you desire, you may choose your Pairfum product based on the, subtleness of the effect you want to achieve. It has also been proven that over time, our noses can, become accustomed to a fragrance which we have been using for a period of time. 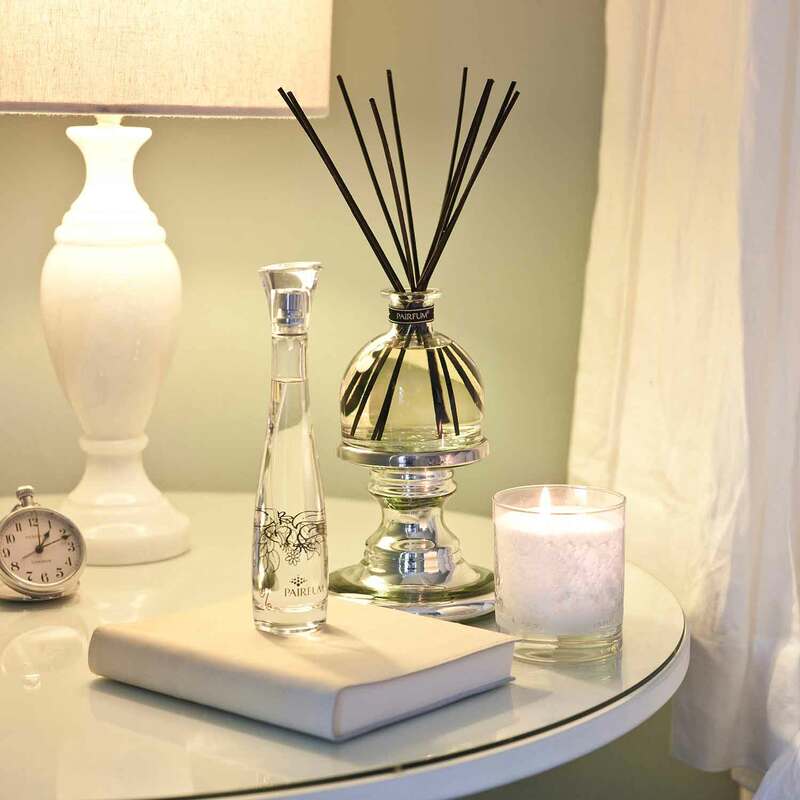 Once you find yourself not detecting a fragrance, move it into another room, or a different position within the room for a period of time and you will be amazed at the difference! Fresh green citrus notes are more volatile and will evaporate more quickly than the, heavy, woody, vanilla style fragrances that will linger. The frequency with which you,turn the reeds and the air conditions in which the diffuser is placed can also affect, the longevity of the product .If the room is large with air-conditioning or drafts, the, product will ‘evaporate’ much more quickly than if it is placed in a small, room with, minimal ventilation. A Woman – the World’s first Perfumer! We have been in love with and enjoying Perfume for thousands of years, from the moment of the first recorded Perfumer, a Lady named ‘Tapputi’ or also referred to as ‘Tapputi – Belatekallim’, which means overseer or keeper of a Palace. She is mentioned in a tablet dated around 1200 BC in Mesopotamia. In her fragrances she used flowers, oil, Calamus (also knows as Sweet Flag, that resembles the Iris), Cyperus, Myrrh and Balsam. She then added water or other solvents, then distilled and filtered it several times. This is also believed to be the oldest reference to a still. So, not only is the wonderful Lady the first recorded Perfumer in the World, she was also a Chemist. From references in the Book of Exodus which describes a sacred perfume that consisted of liquid myrrh, fragrant cinnamon, fragrant cane, and cassia, to the Bronze Age Perfumeries of Cyprus, we have continued our love affair with perfume. Today on International Fragrance Day, 21st March 2018, why not celebrate the wonderful gift of scent, from your favourite Flower to the bouquet of your most loved Wine or Spirit, freshly baked Bread, to the aroma of a wonderful meal. The Scents of Life surround us on a daily basis and remind us of the past, the present and the wonderful future to come. 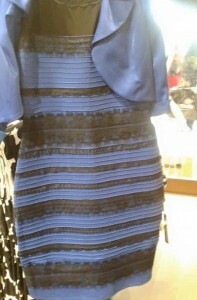 Who could have imagined that “The Dress of Many Colours”could cause such a storm and have us debating whether it is ‘White & Gold’ or Blue & Black’ ?? Colours like Perfume are very evocative and emotive, making us ‘Feel and Look Good’ and Colours like Perfume also change with light. So which #Colour-Group did you fit into #? Many #scientific reasons may be put forward as to #WHY?, but we at Pairfum feel that #Personality & #Mood also plays a large part in the #Colour-debate. Did #anyone #else see ‘Blue & Gold’ or ‘Black & White ??? The Dress of Many Colours ? ?